Roger Smith, of Roger W Smith Ltd watch, clock and chronometer makers, runs a unique business in Ballaugh producing handmade timepieces. The watches produced are true works of art and continue a long tradition of English horology. 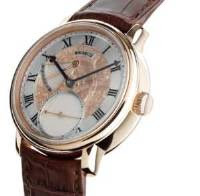 Roger W Smith watches sell for anything up to £51,000 each.